A big part of learning a new language is having the self-control to spend many hours a week improving your abilities. It can be difficult to do this after a long day of work when it’s much easier to turn on the TV than to practice your English. 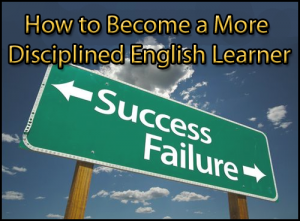 If you’re a self-directed English for Life learner, you understand that no one else is going to make you into an exceptional English speaker. You can find other people to support you, but you have to do it yourself. And that means you need to have the discipline to to do it. But how can you develop more self-discipline? How can you force yourself to do things that you know are good for you, when you don’t feel motivated to do them in the moment? Before we get into specific techniques and strategies to help you improve your self-control, let me first tell you about some of my discipline accomplishments. This isn’t to brag [to boast/talk with excessive pride], but to show you what YOU can do if you start developing your discipline. Biking: I biked 65km one day, then 175km the very next day (without any training or preparation). The furthest I’d ever biked previously was 15 miles in one day. Diet: I’ve done two 30-day diets of only eating raw (uncooked) fruits, vegetables, and nuts. That means no rice, no beans, no meat, no cheese, no potatoes, nothing that you have to cook to eat for 30 days. I’ve done this twice. Meditation: I’ve attended two 10-day Vipassana meditation courses (learn more about how meditation can improve your English). In these courses you meditate for 10 hours a day for 10 days. During this time you’re not allowed to speak, read, write, watch TV, go on the internet, listen to music, draw, or do anything except meditate, rest, or eat. Now, regardless of whether or not you think these are smart or healthy things to do, the fact is is that these are not easy tasks. It takes an incredible amount of self-control to not eat anything for eight days. But what’s the link between these acts of discipline and improving your English? Discipline effects every area of your life. The better your self-control, the easier it is to do things that are good for you, like practicing and improving your English. So how can you improve your discipline? Your ability to do something when you would much rather be doing something else takes strength. And you build this strength, just like you build your muscles: by working out. If you know anything about muscles, you’ll know that if you don’t exercise them, they won’t be very strong. And to get them stronger you have to use them. So how can you “grow” your discipline muscles? The same way you build normal muscles. If it’s your first time in the gym, are you going to walk over and grab the heaviest weights and start lifting? No, you’re going to start with light weights and progress to heavier and heavier weights as your body gets used to the stress of exercising. It’s the same way with discipline. You want to start with something easy and naturally progress to more and more difficult things. Then, maybe one day you can go eight days without eating any food (or not). Part of building self-discipline is being honest with yourself about what you can do. If you don’t practice English at all, do you think you’re going to be able to start practicing two hours a day? Probably not. However, if you don’t spend any time studying English, could you increase that number to 5 minutes a day? Definitely. So understand and accept your current level. If you are too negative, you’ll only lift very light weights (or none) and won’t get any stronger. If you are too positive, you’ll keep trying to lift weights that are too heavy for you and failing, and afterwards you’ll likely get frustrated with yourself. But either way, you won’t get any stronger. So when exercising your self-discipline, it’s important to know what you are capable of. It’s okay to start slow and gradually lift more difficult weights. The first thing you should do, is to clarify your purpose. If you don’t know why you want to be a better English speaker, you’ll probably lose your motivation. After you’ve clarified exactly WHY you want something, it leads the way to accomplish it. And one of the things that has greatly helped me accomplish my goals is going on 30 day trials. A 30 day trial is where you commit to doing something (usually every single day) for 30 days. By focusing on doing just one simple thing every day for 30 days and DOING it, even if every cell in your body is resisting it, you’re going to greatly improve your discipline. The point of a 30 day trial is not necessarily about the importance of the task that you’re doing. The importance comes from actually DOING it. But this is the most important part of the exercise. It’s not necessarily about the importance of the task, it’s about the importance of doing something that you know is good for you and that you committed (to yourself and/or others) to doing! What you’re training yourself to do is to do what you know is best for you, not what you feel like doing right now. Because as soon as you say, “Oh, I’ll just skip this one day,” it’s going to make it MUCH more likely that you’ll skip the next day or the one after that. So start with something easy and COMMIT to doing it. How much time do you already spend practicing your English. Do you think your life would be better if you practiced more? In the long run, what you do is less important than ACTUALLY DOING IT. Building up your discipline muscle is one of the most valuable skills you can have. It will not only help you with your English, but just about everything in your life. So, what do you want most? Why? What can you do to make small, daily habits to improve your English? NOW DO IT. EVERY DAY. Looking to Put Your Discipline to Use? Sign up for our weekly newsletter and stay up-to-date on everything we do at Real Life English. Hey Wallace, thanks for the comment. I’d recommend starting with this article I just posted, The 4 Most Effective Exercises for Learning Real Life English. Thank Real Life so much. Now, I know, I lost so many opportunities to learn English, so why don’t I pick myself up and start to learn English right now.